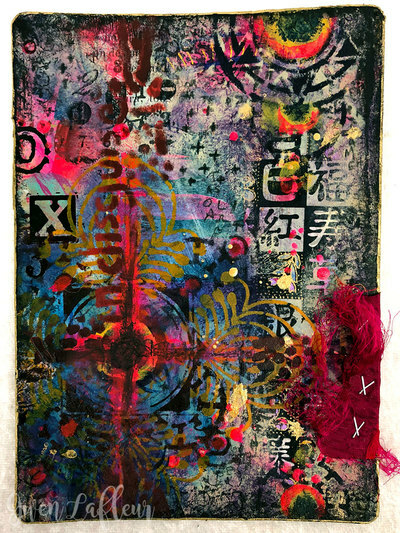 "Collide" mixed media artwork - 5" x 7" x 1/8" on illustration board. 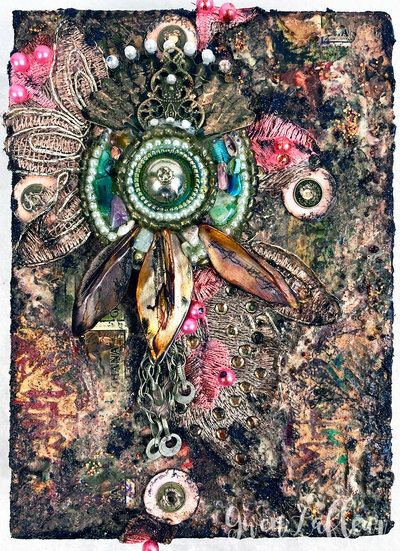 Collage, heat embossing, found objects, and semi-precious gemstones. 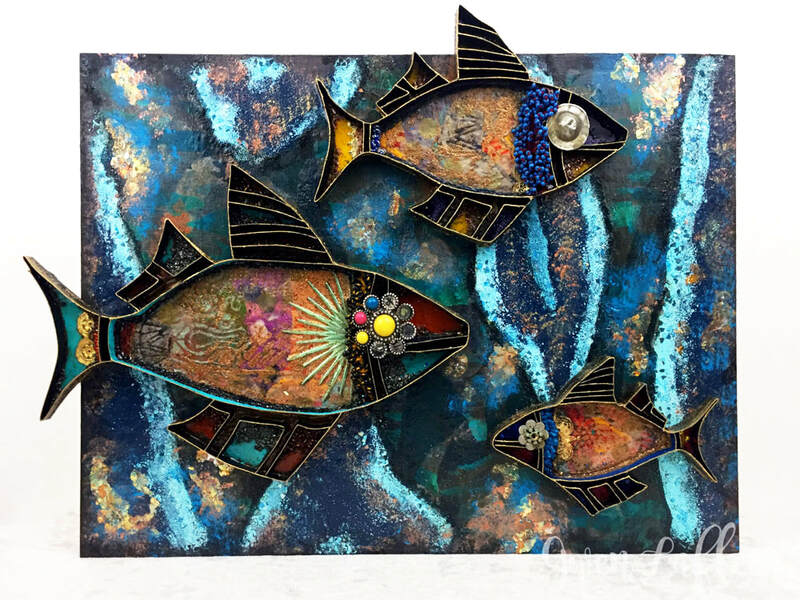 $74.95 - email if interested. 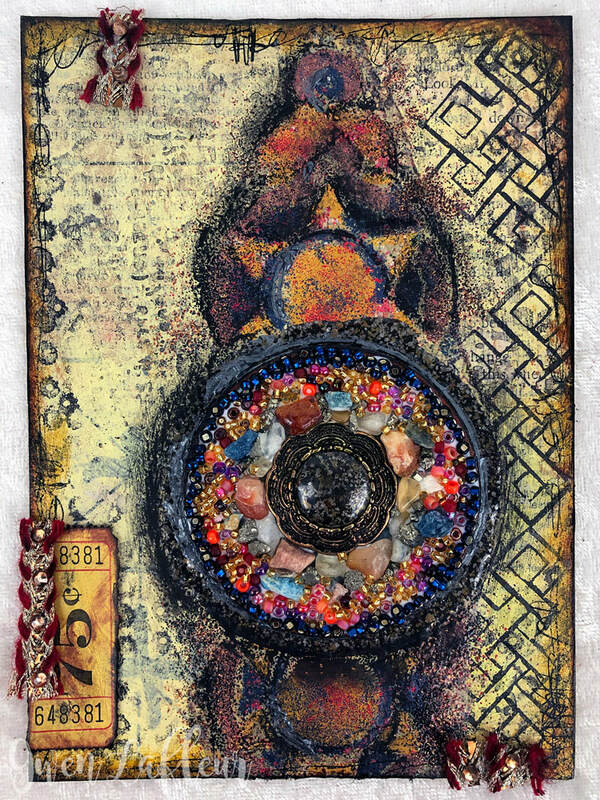 "Gypsy Garden" mixed media artwork - the center section is 5" x 7" on illustration board set in a vintage film cartridge that's about 6" x 9". 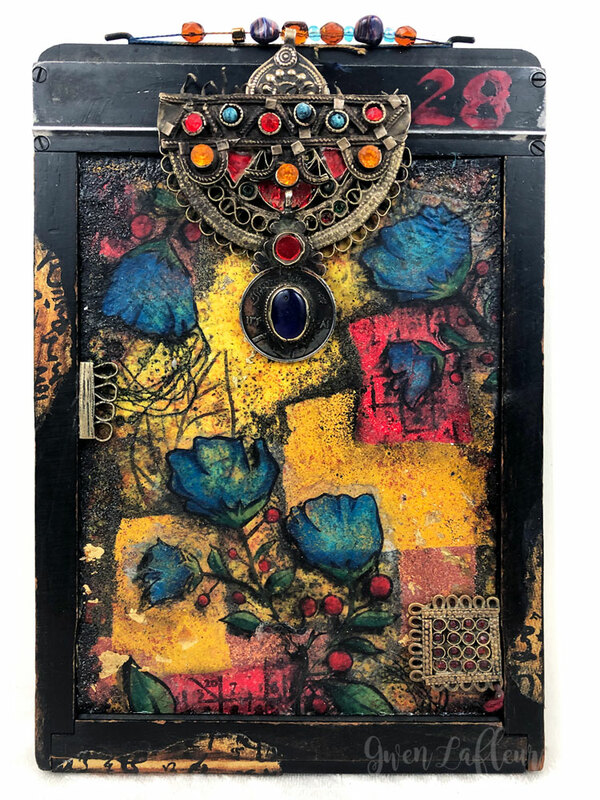 Heat embossing, collage, vintage Turkmen jewelry parts, and colored pencil. $224.95 - email if interested. "Medallus" mixed media artwork on 5" x 7" x 1/8" illustration board. 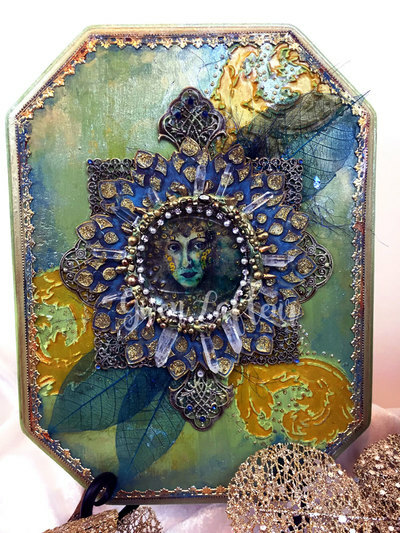 Features collage, stamping, acrylic paint, heat embossing, and a medallion made from Czech glass beads and semi-precious gemstones. $84.95 - email if interested. 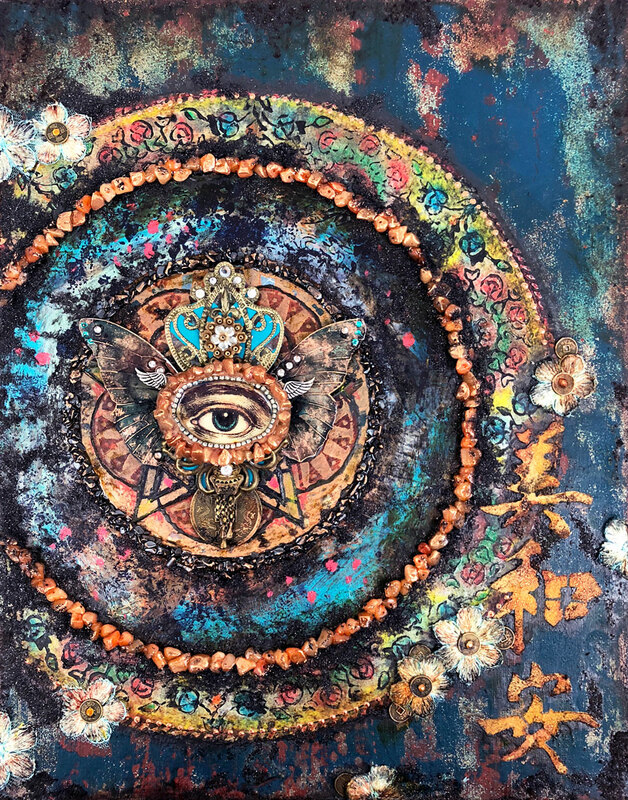 "Focus" mixed media artwork on 5" x 7" x 1/8" illustration board. 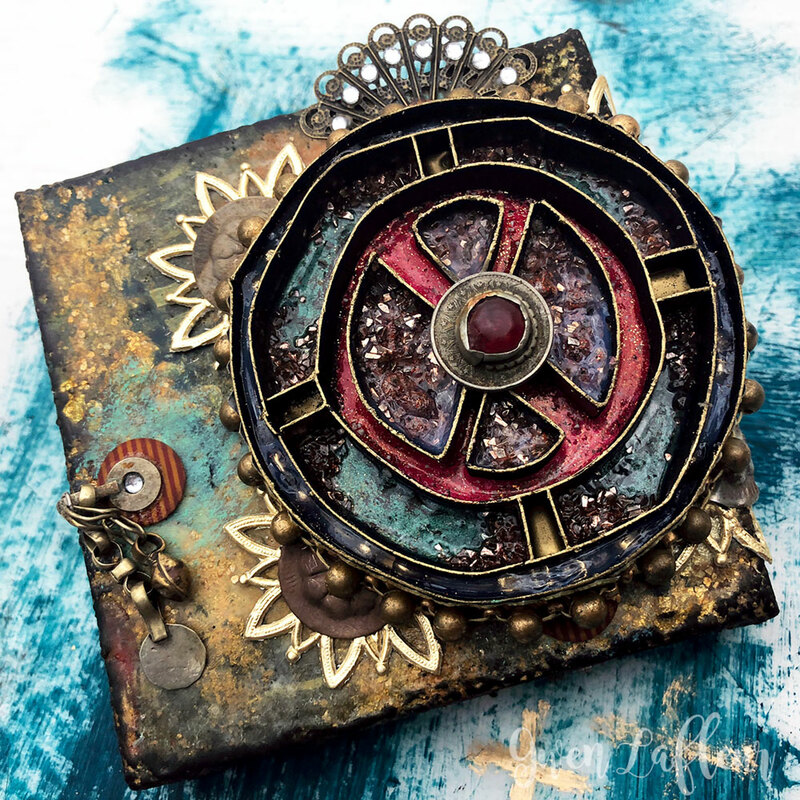 Features collage, vintage ephemera, stamping, acrylic paint, heat embossing, and a medallion made from Czech glass beads and semi-precious gemstones. $84.95 - email if interested. 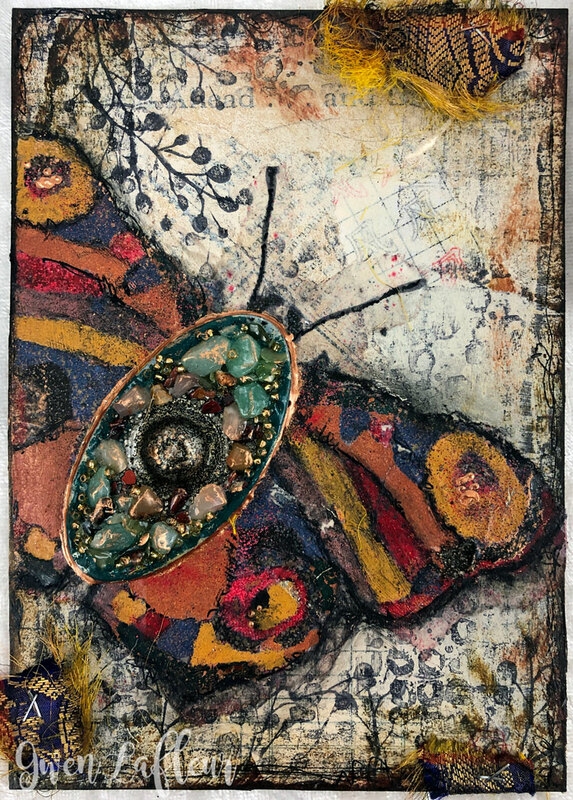 "Papillon" mixed media artwork on 5" x 7" x 1/8" illustration board. 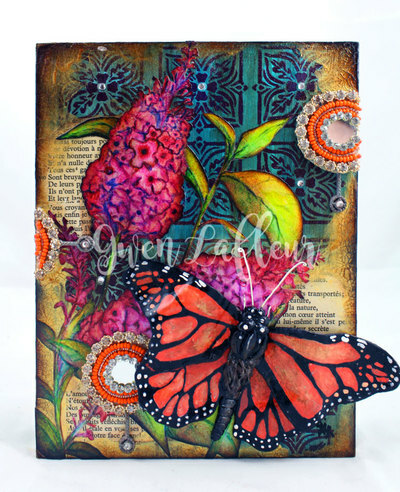 Collage, stamping, and paint with a heat embossed butterfly and a medallion center made from semi-precious gemstones and a vintage Turkmen button. $84.95 - email if interested. 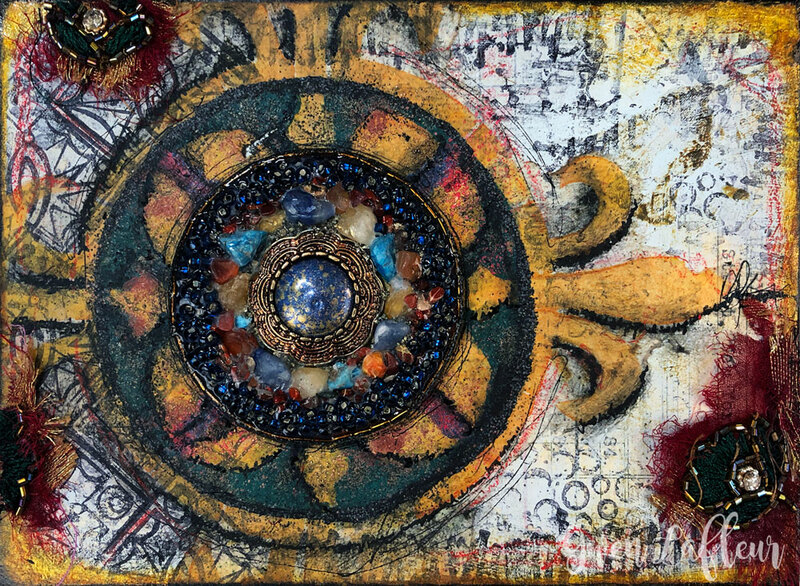 "Lapis Icon" mixed media artwork. 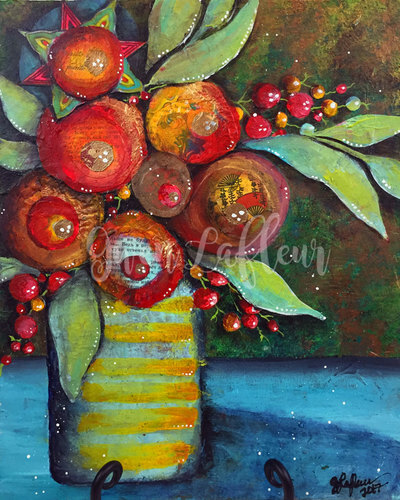 Measures approximately 8" x 16" x 2" on a cradled birch panel. 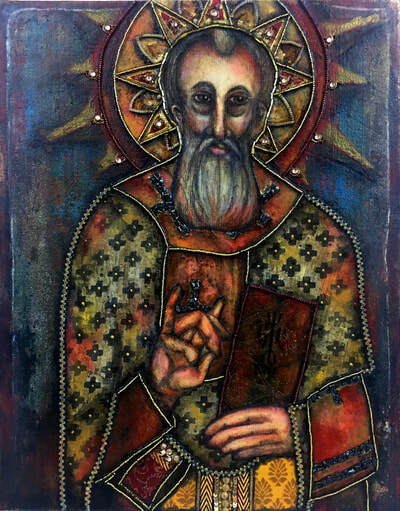 The face is hand-drawn with colored pencil and acrylics. 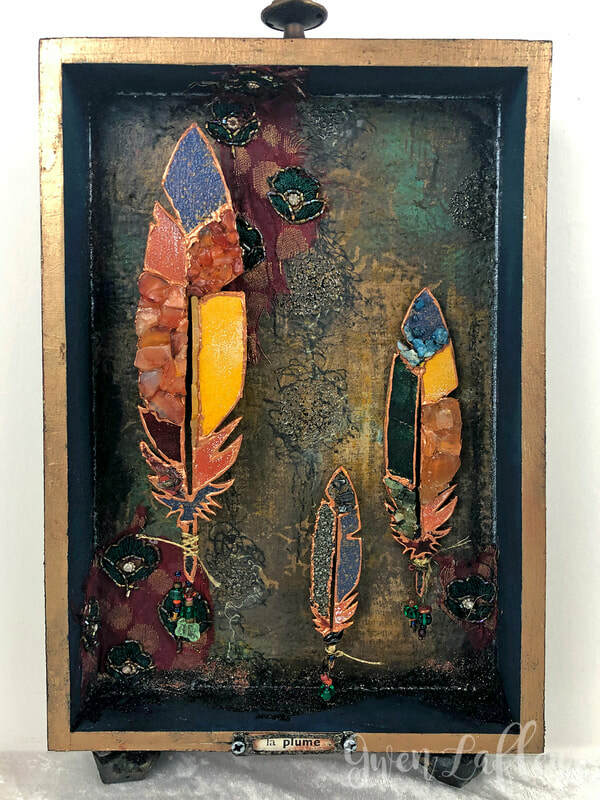 The piece features collage, Czech glass beads, heat embossing, embroidered fabric, semi-precious gems, and vintage jewelry parts. 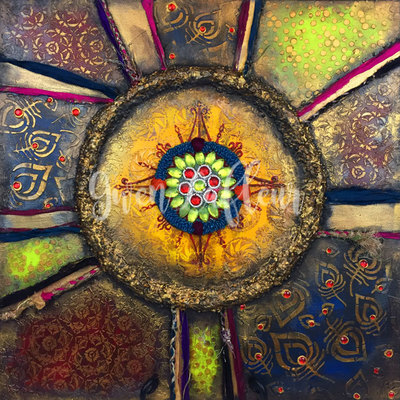 $494.95 - email if interested. "Begin Again" mixed media Art Card. 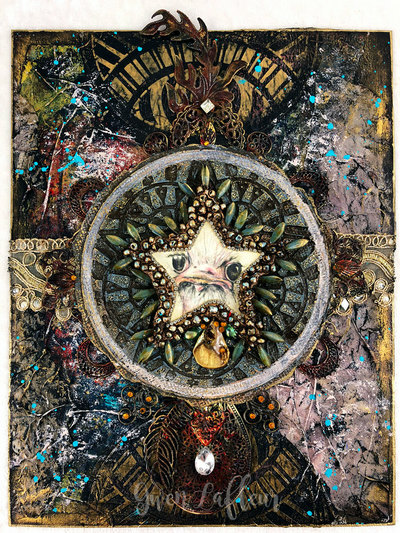 5" x 7" altered playing card with collage, beaded embroidery, stenciling, and paint. $54.95 - email if interested. "Notre Dame de la Foi" mixed media artwork by Gwen Lafleur. 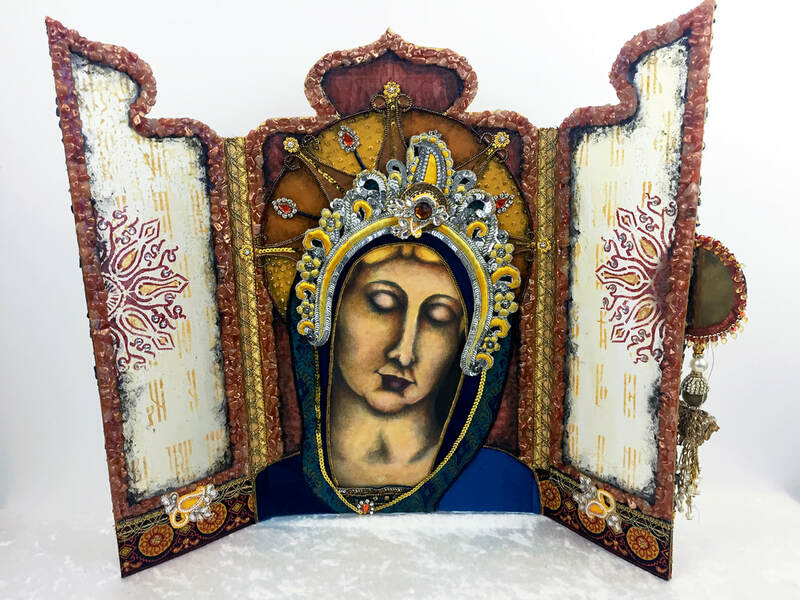 Handmade triptych with pencil and soft pastel portrait, fabric, beading, acrylics, and found objects. 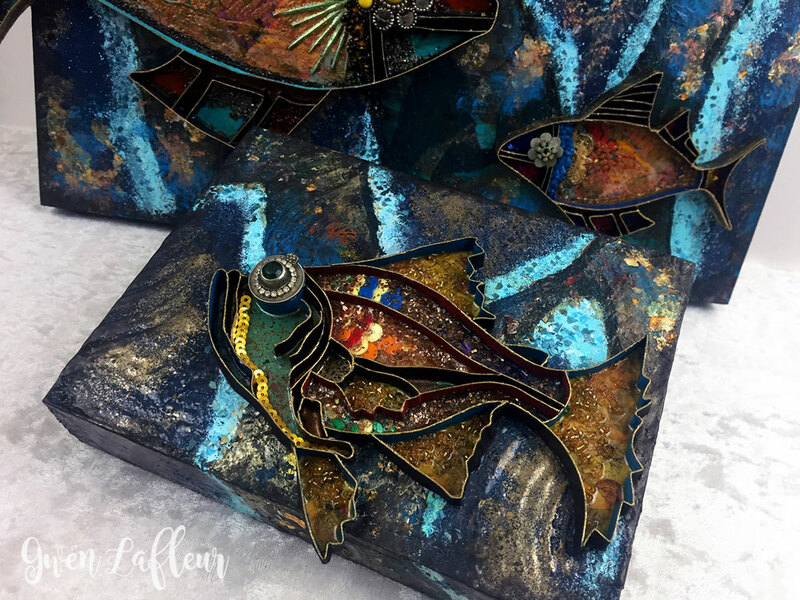 Featured in the Fall 2018 issue of Somerset Studio magazine. 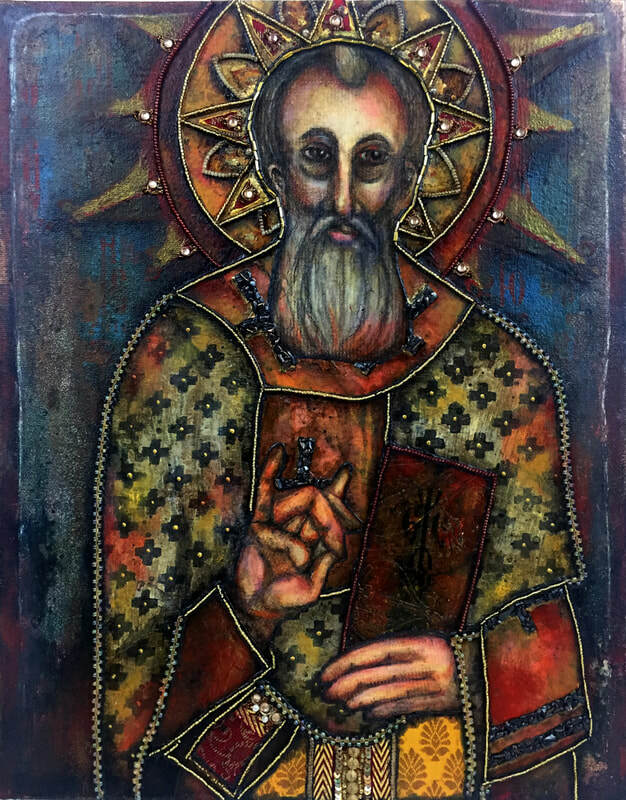 "Nikolai" mixed media artwork by Gwen Lafleur on 11" x 14" canvas panel. 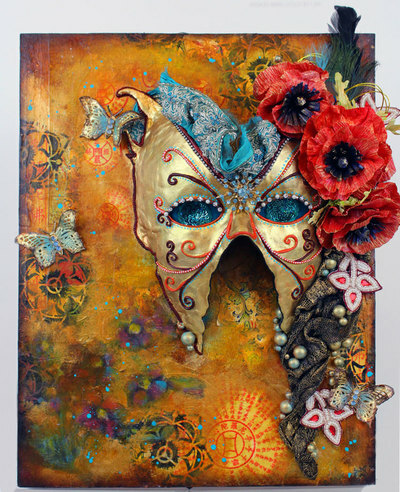 Hand-drawn face with colored pencil, acrylics, collage, beading, embossing powder, and stenciling. Featured in the Fall 2018 issue of Somerset Studio magazine. "Enduring Faith" mixed media artwork by Gwen Lafleur. Acrylic painting in a tin Mexican nicho with beading, fabric, hand embroidery, and faux rust. 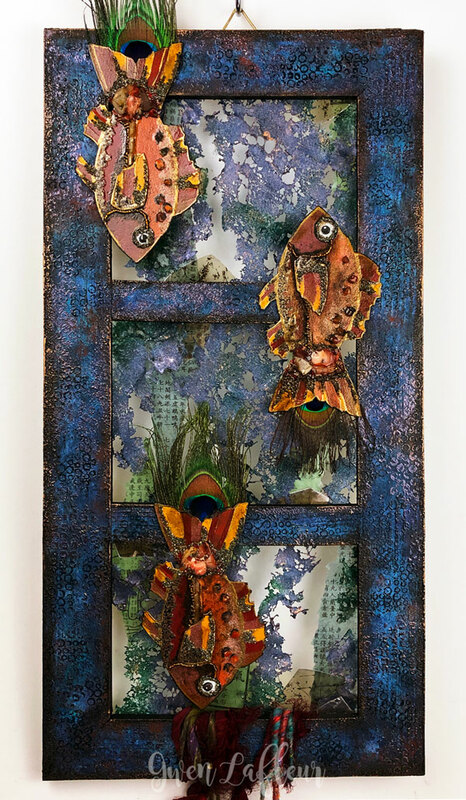 Featured in Fall 2018 issue of Somerset Studio magazine. 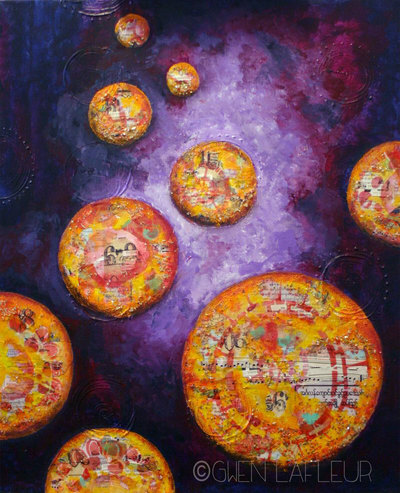 "A Thousand Times..." Mixed media artwork by Gwen Lafleur. 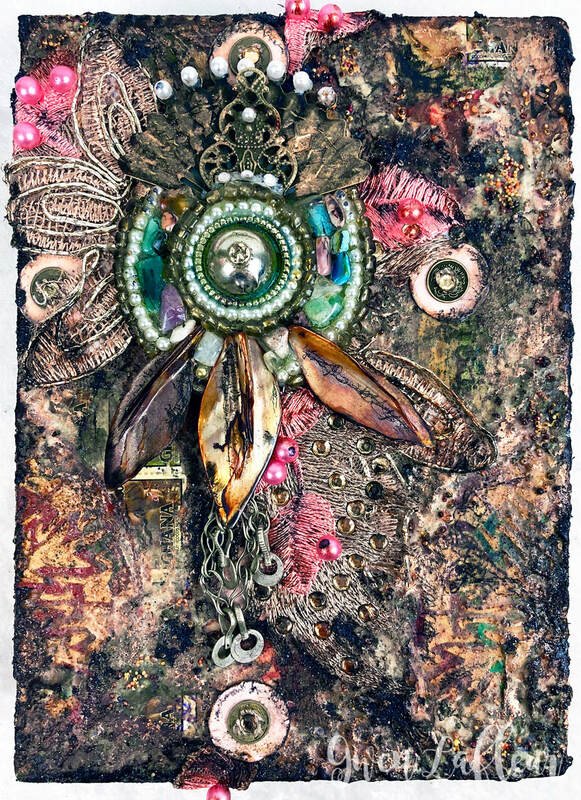 6" x 8" x 1-1/2" on cradled birch panel with beads, found objects, fabric, collage, and paint. $195 - email if interested. 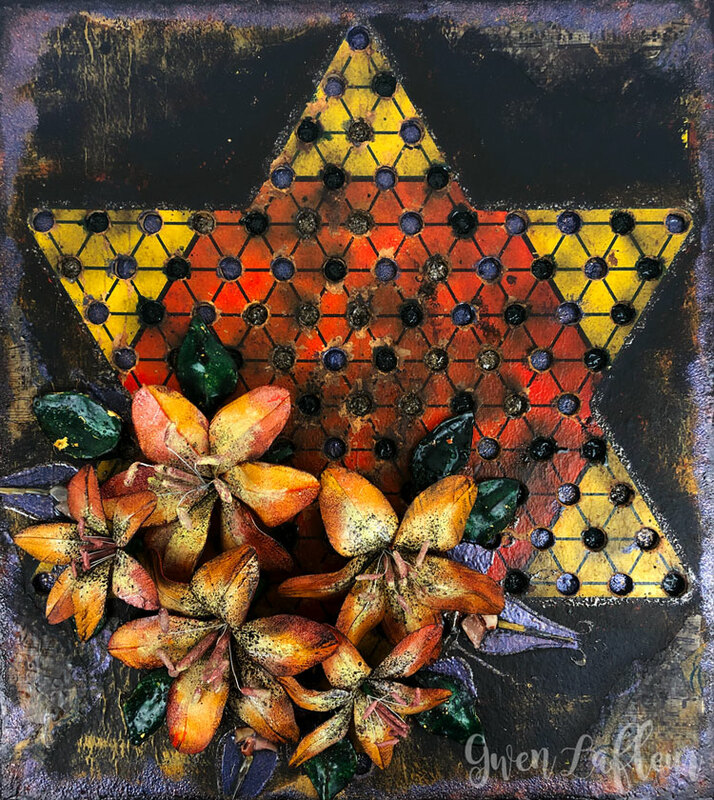 "Grace" - mixed media artwork by Gwen Lafleur on 12" x 16" x 1-1/2" cradled birch panel. 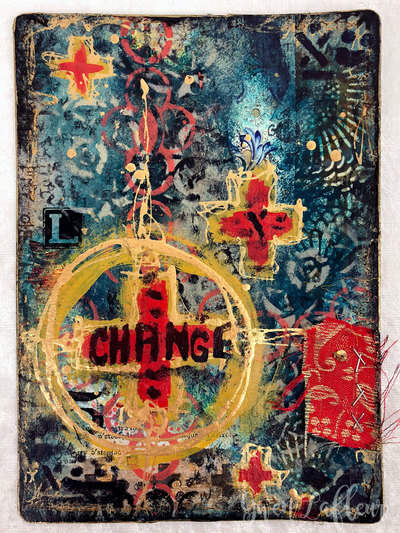 Uses collage, found objects, stencils, fabric, embossing powder, acrylics, and colored pencil. 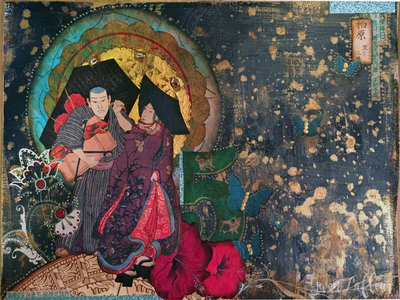 $425 - email if interested. 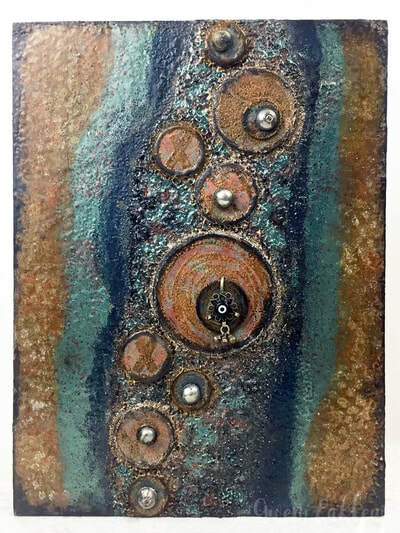 "Sands of Time" mixed media on birch panel, 6" x 12" x 1-1/2". 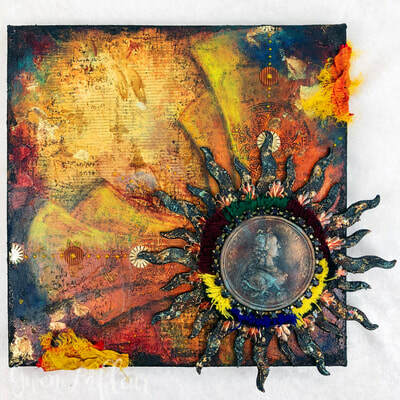 A study in texture using acrylic paints and mediums, embossing powder, collage, and a small assemblage focal point with an Indian sari patch, a vintage Kuchi button, and a brass elephant charm. $225 - email if interested. 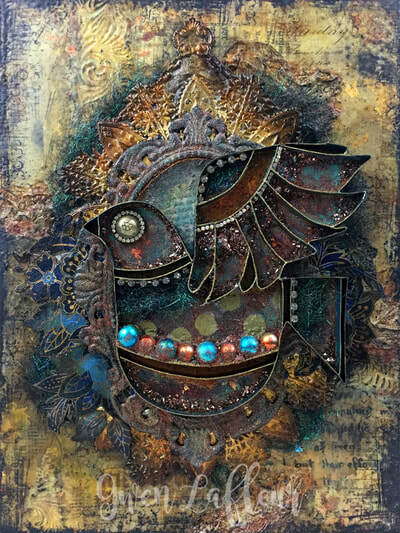 "Ornery Ostrich" mixed media artwork by Gwen Lafleur. 8-1/2" x 11" x 1/8" on matboard. Collage, stenciling, textiles, acrylic paint, and assemblage with metal findings, vintage rhinestones, and glass beads. Ostrich image is a digital drawing, also by Gwen, printed out and enhanced with colored pencil and acrylic glaze. "Crossing Paths" mixed media artwork by Gwen Lafleur. 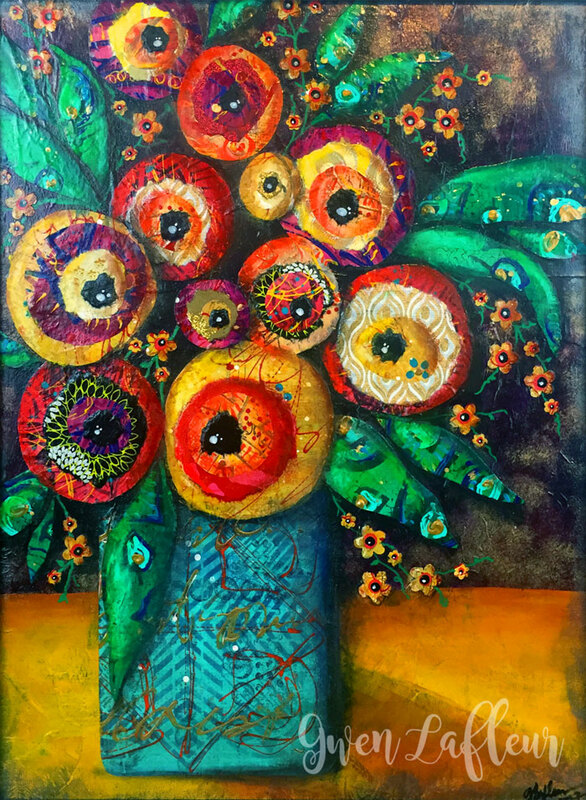 16" x 12" x 1-1/2" on stretched canvas. 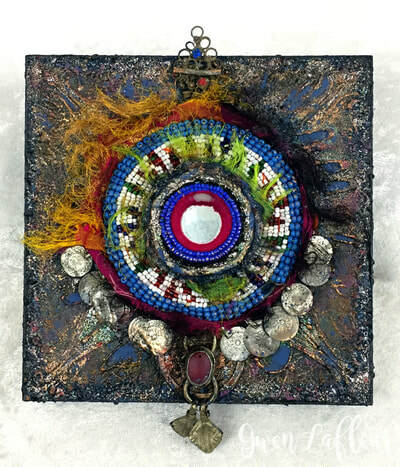 Collage, acrylic paint, stenciling, textiles, and found object / vintage jewelry assemblage. 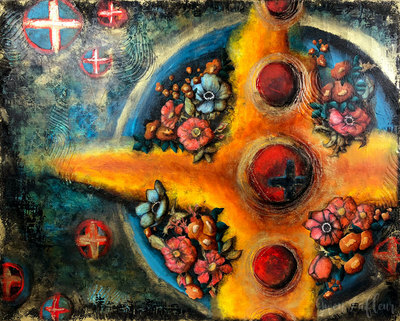 $245 - email if interested. 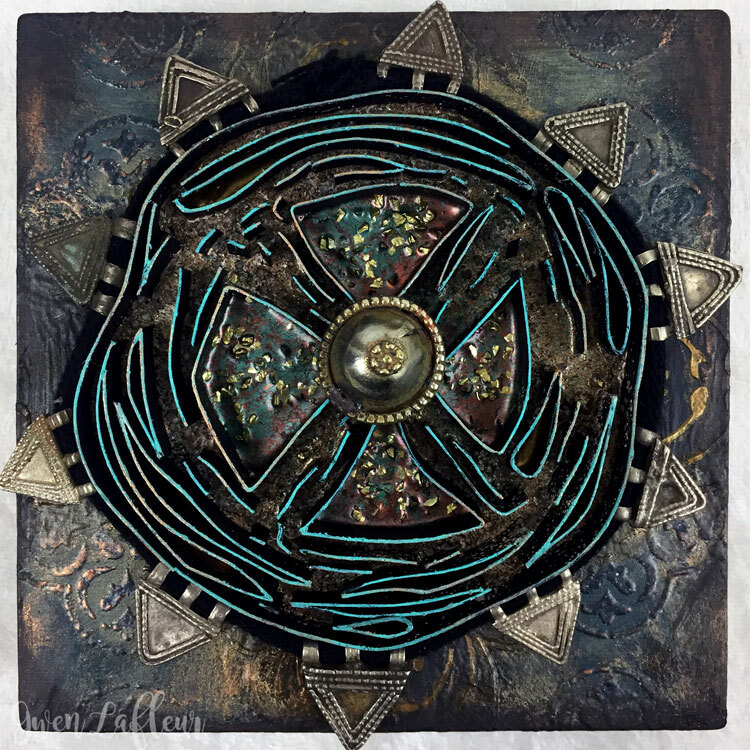 "Stolen" mixed media artwork by Gwen Lafleur. 5-3/4" x 11-3/4" x 1-1/2" on a cradled wood panel. 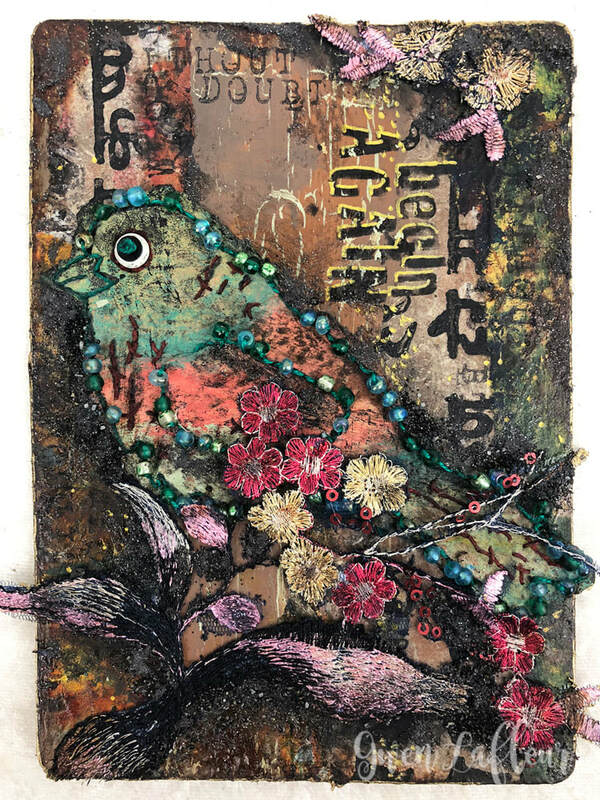 Collage, embossing powder, acrylic paint, stenciling, and assemblage with vintage textiles and jewelry parts, metal findings, and glass beads. 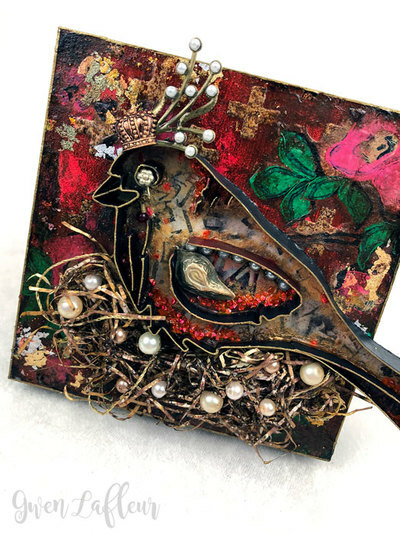 "Queen of Her Nest" dimensional mixed media artwork by Gwen Lafleur. 6" x 6 x 1" on cradled birch panel with dimensional collage, acrylic paint, findings, jewelry parts, and stenciling. $165 - email if interested. 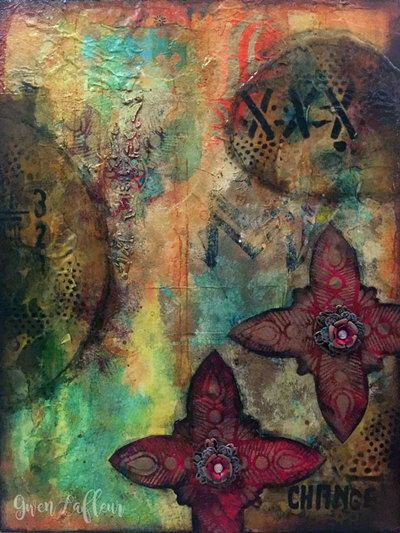 "X Marks the Spot" dimensional mixed media artwork by Gwen Lafleur. 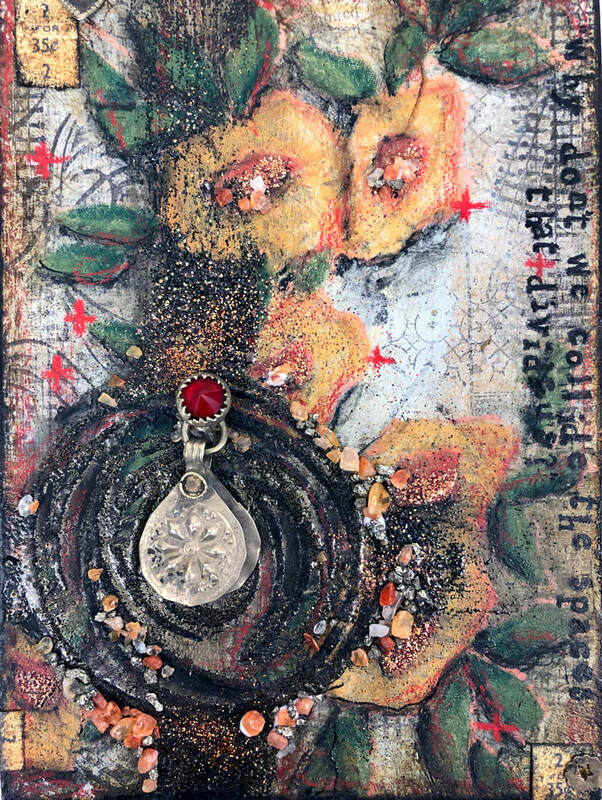 4" x 4 x 1"" on stretched canvas with dimensional collage, embossing powder, acrylic paint, findings, jewelry parts, and stenciling. $145 - email if interested. 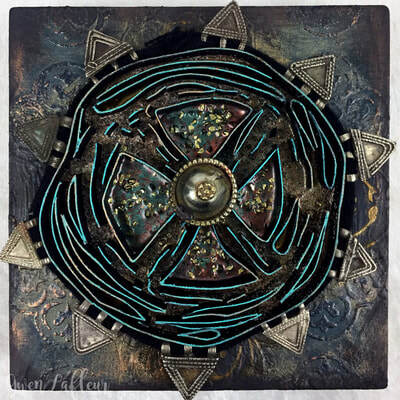 "Ancient Energy" mixed media artwork by Gwen Lafleur. 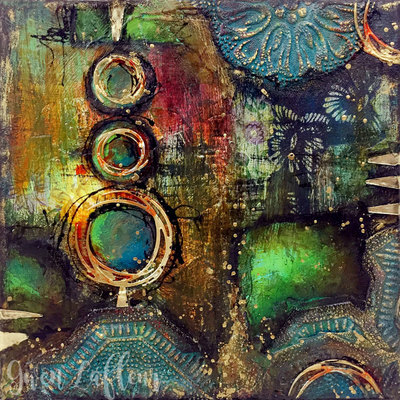 10" x 10" x 3/4" on canvas. $185 - email if interested. "Crossroads" mixed media artwork by Gwen Lafleur. 12" x 16" x 1-1/2" on cradled birch panel. 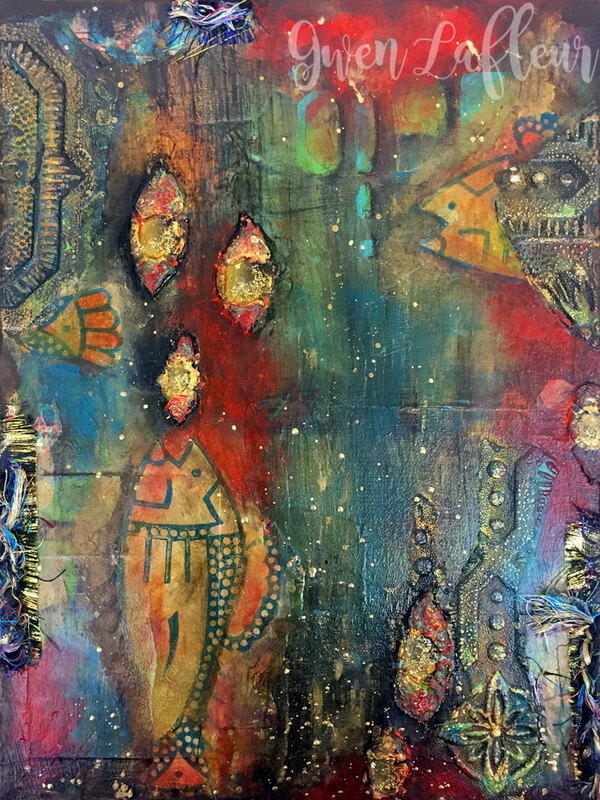 $285 - email if interested. 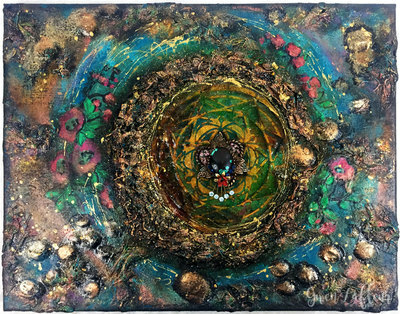 "Cenote" mixed media artwork by Gwen Lafleur. 11" x 14" x 1/2" on stretched canvas. $225 - email if interested. 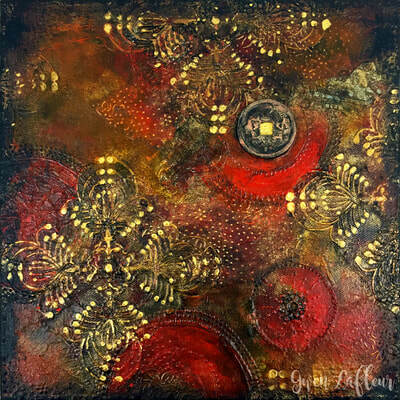 "Fading Beauty" abstract mixed media artwork by Gwen Lafleur. 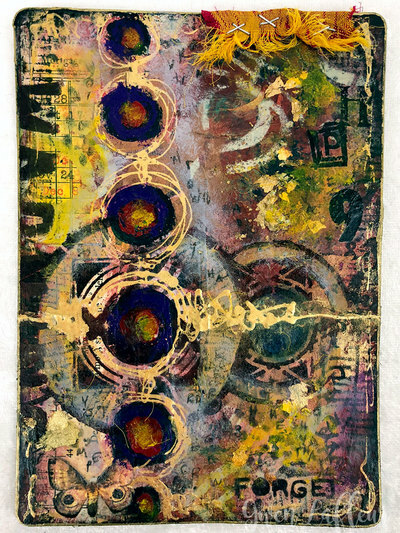 6" x 9" x 1-1/2" on cradled birch panel. "Lucky Coin" mixed media artwork by Gwen Lafleur. 8" x 8" x 1/2" on stretched canvas. $145 - email if interested. "Rite of Passage" mixed media artwork by Gwen Lafleur. 5" x 5" x 1" on cradled birch panel. $155 - email if interested. 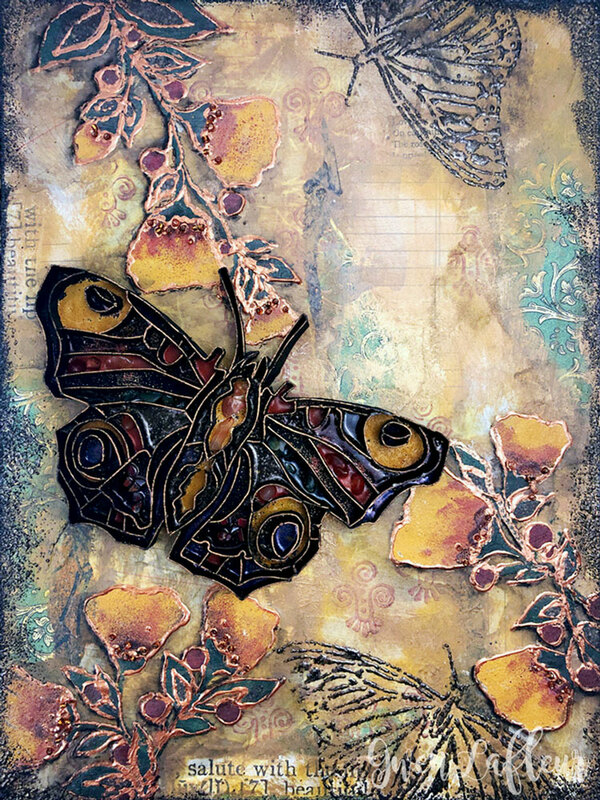 "Aging Gracefully" mixed media artwork by Gwen Lafleur. 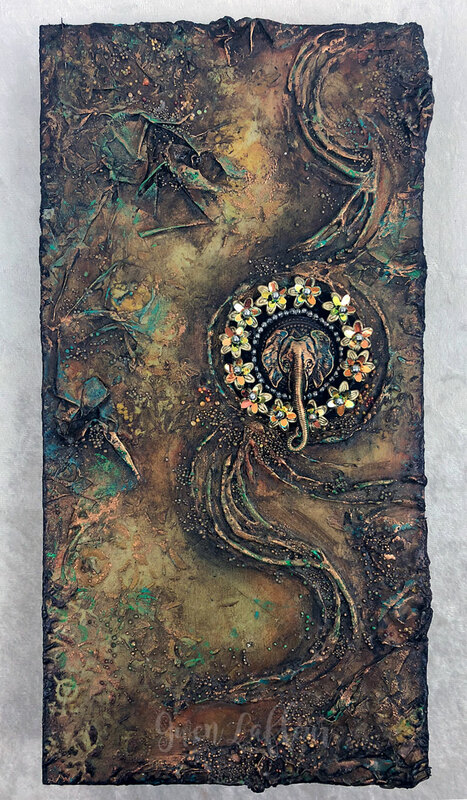 12" x 24" x 1/2" on stretched canvas. 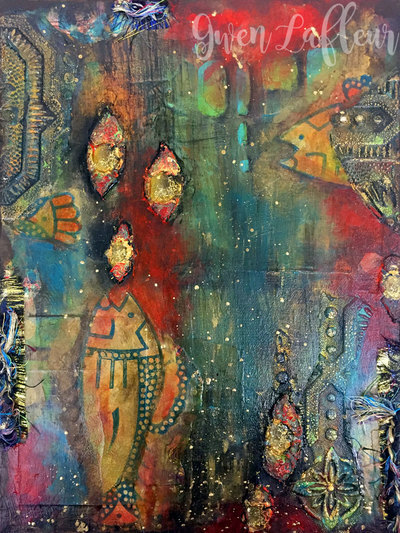 $325 - email if interested. 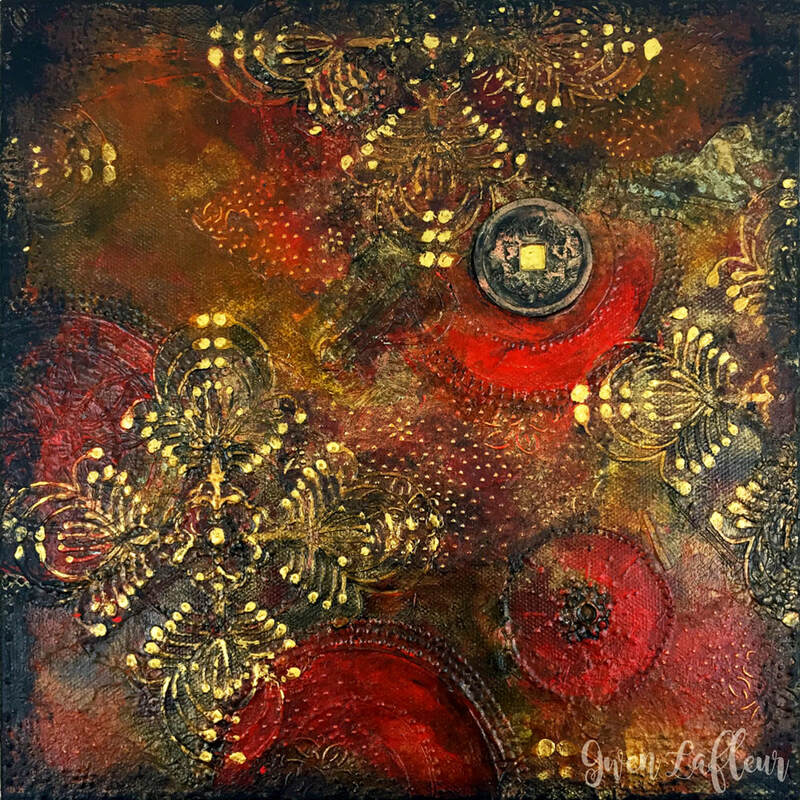 "Rust" mixed media artwork by Gwen Lafleur. 9" x 12" x 1-1/2" on cradled birch panel. $375. 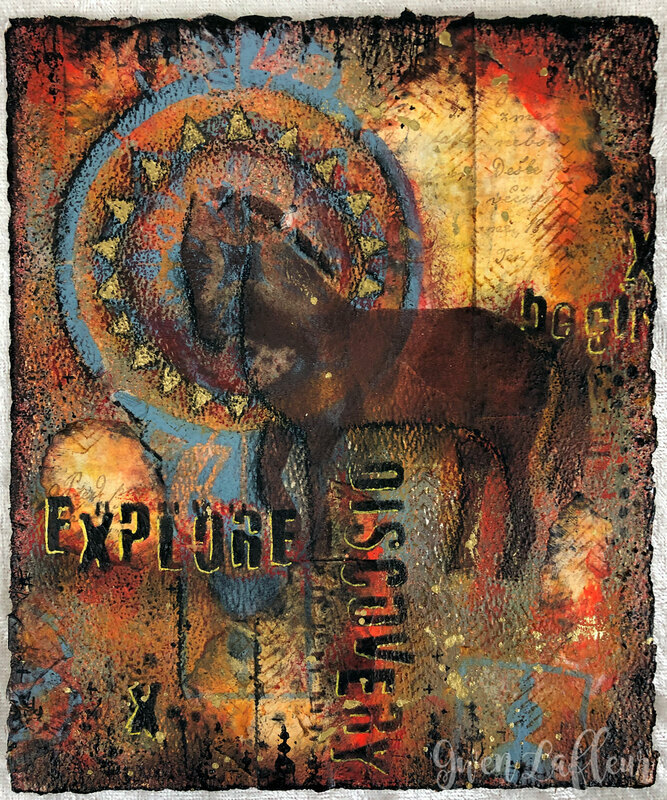 "Go Your Own Way" mixed media artwork by Gwen Lafleur. 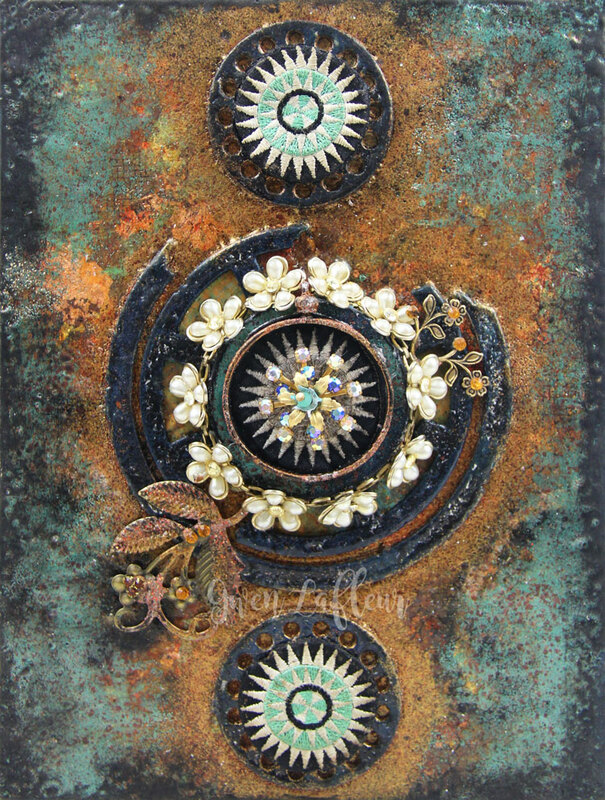 16" x 12" x 1-1/2" on cradled birch panel. SOLD. "Eye of the Storm" mixed media artwork by Gwen Lafleur. 8-1/2" x 11" x 1/4" on canvas panel. $195 - email if interested. 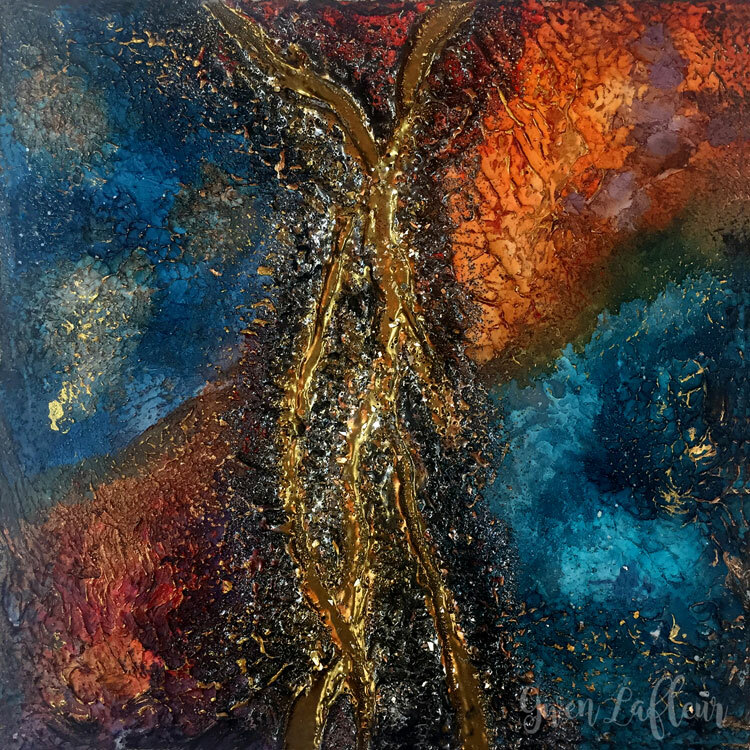 "One Tree Hill" abstract mixed media artwork by Gwen Lafleur. 8" x 8" x 1/2" on stretched canvas. 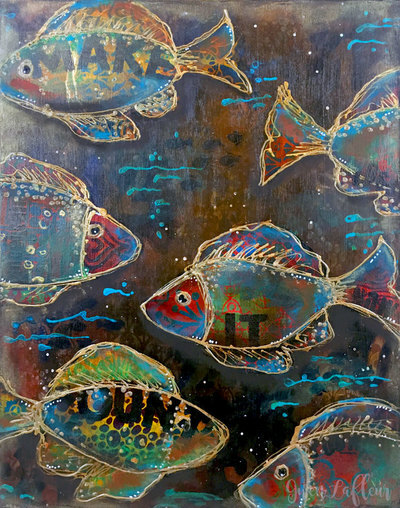 "Fish Food" mixed media artwork by Gwen Lafleur. 9" x 12" x 1/2" on stretched canvas. 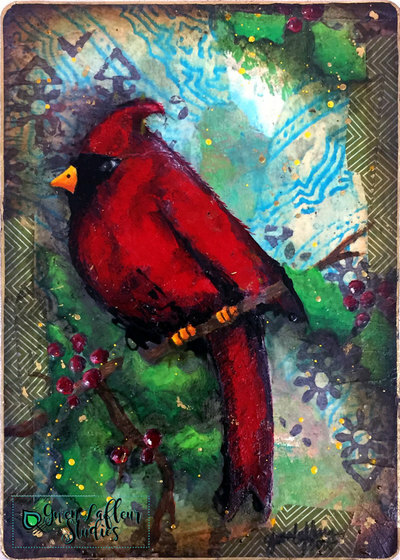 "Winter Cardinal" mixed media artwork by Gwen Lafleur. 5" x 7" on paper. SOLD. "Choose Love" mixed media artwork by Gwen Lafleur. 18" x 18" x 1-1/2" on cradled birch panel. SOLD. 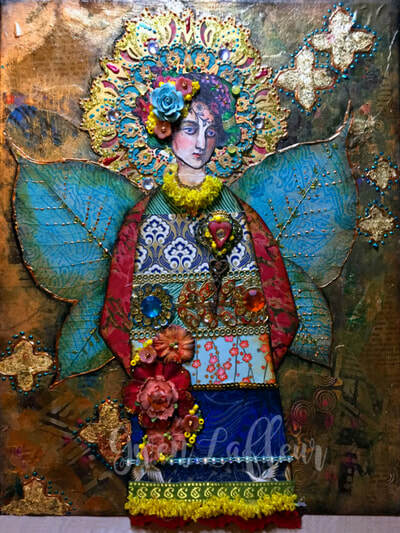 "Boho Fairy" mixed media artwork by Gwen Lafleur. 11" x 14" x 1/2" on stretched canvas. 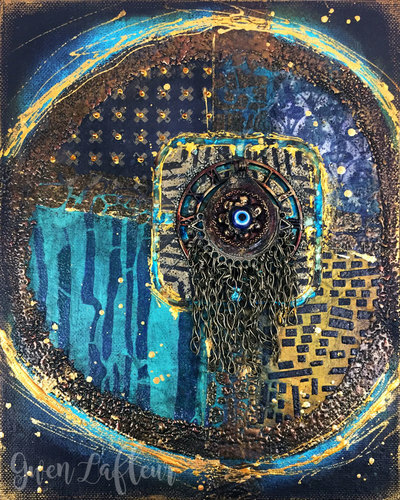 $245 - email if interested. 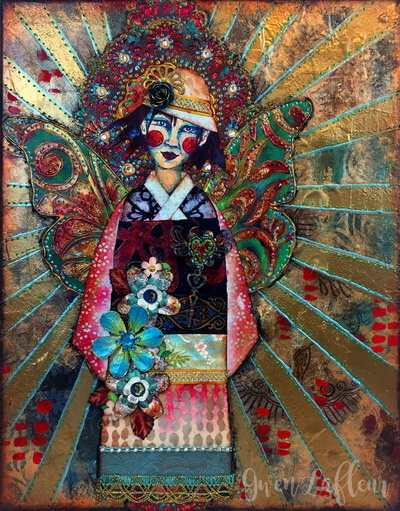 "Madame Butterfly" mixed media artwork by Gwen Lafleur. 11" x 14" x 1/2" on stretched canvas. 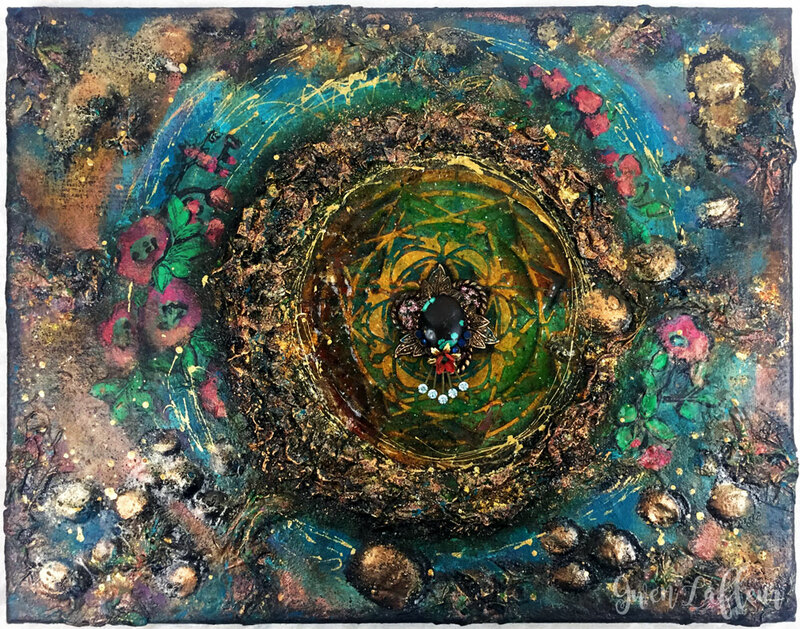 $245 - email if interested. "My Mother's Flowers" mixed media artwork by Gwen Lafleur. 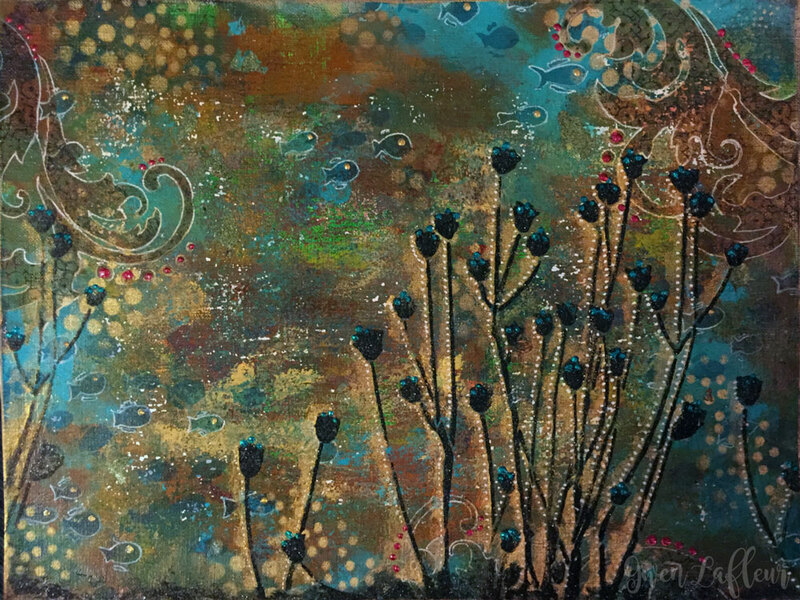 12" x 16" x 1/2" on canvas panel. SOLD. 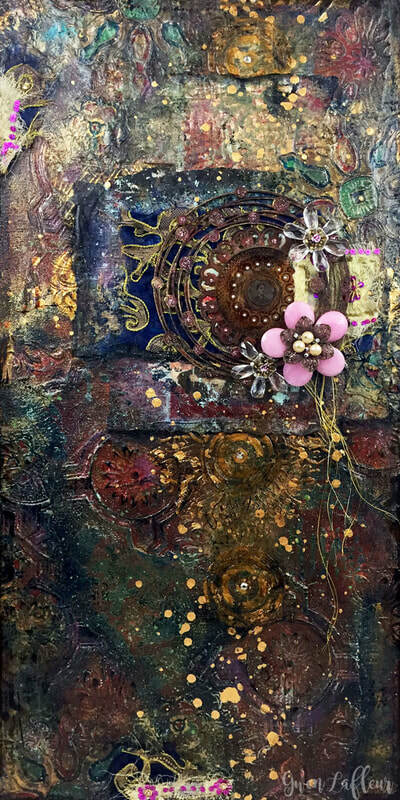 "Go for Baroque" mixed media artwork by Gwen Lafleur. 11" x 14" on paper. 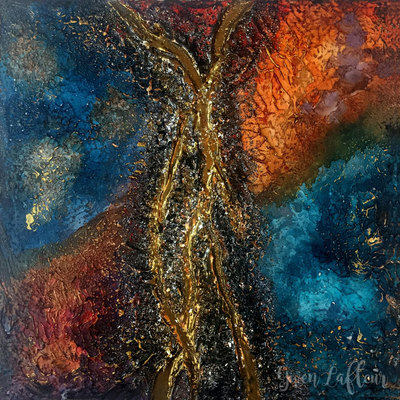 "Cracked Pavement" abstract mixed media artwork by Gwen Lafleur. 6" x 6" x 1" on cradled birch panel. $115 - email if interested. 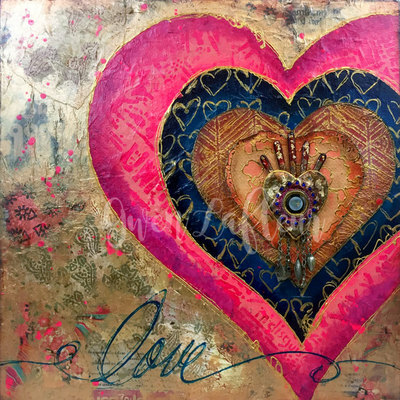 "Boho Bliss" mixed media artwork by Gwen Lafleur. 18" x 18" x 3/4" on stretched canvas. 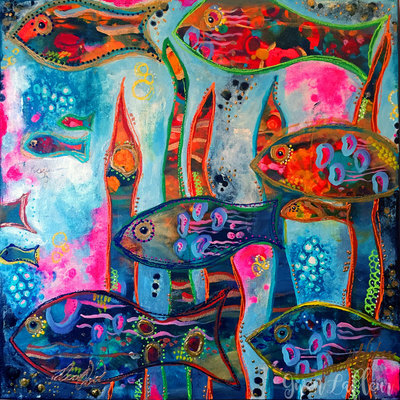 $195 - email if interested. "Of Angels & Icons" mixed media artwork by Gwen Lafleur. 11" x 14" x 1/2" on stretched canvas. 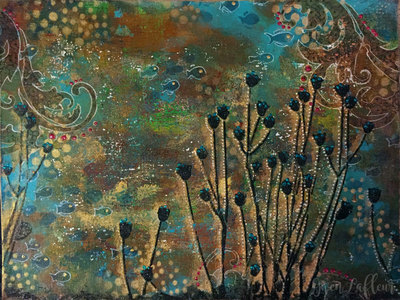 $245 - email if interested. 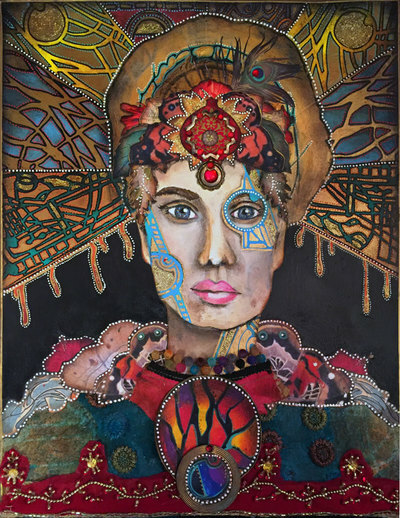 "Fire Goddess" mixed media artwork by Gwen Lafleur. 11" x 14" on paper. $325 - email if interested. 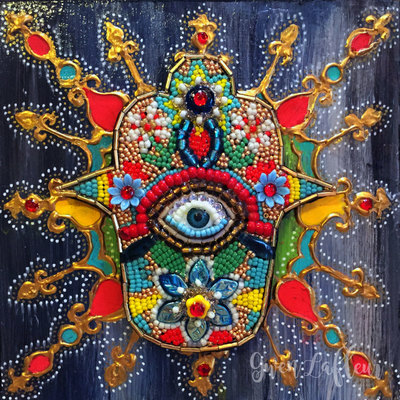 "Beaded Hamsa" mixed media artwork by Gwen Lafleur. 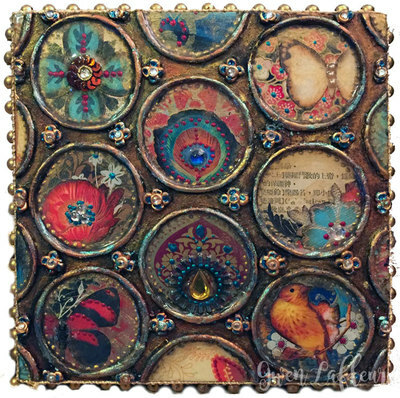 6" x 6" x 1" on cradled birch panel. $175 - email if interested. 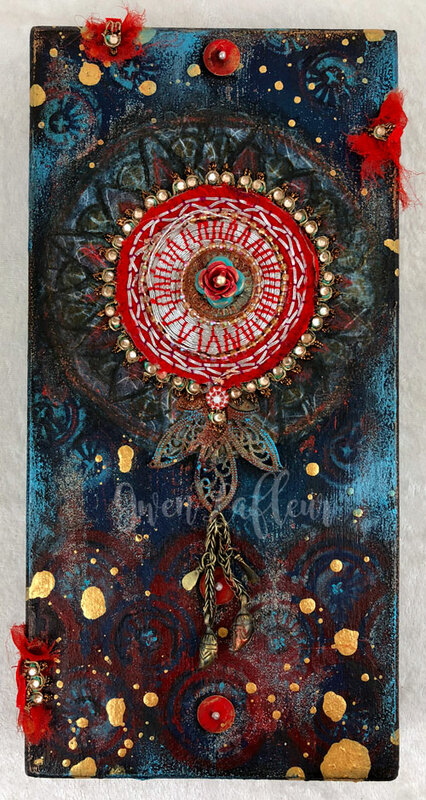 "Ephemeral Reliquary" mixed media artwork by Gwen Lafleur. 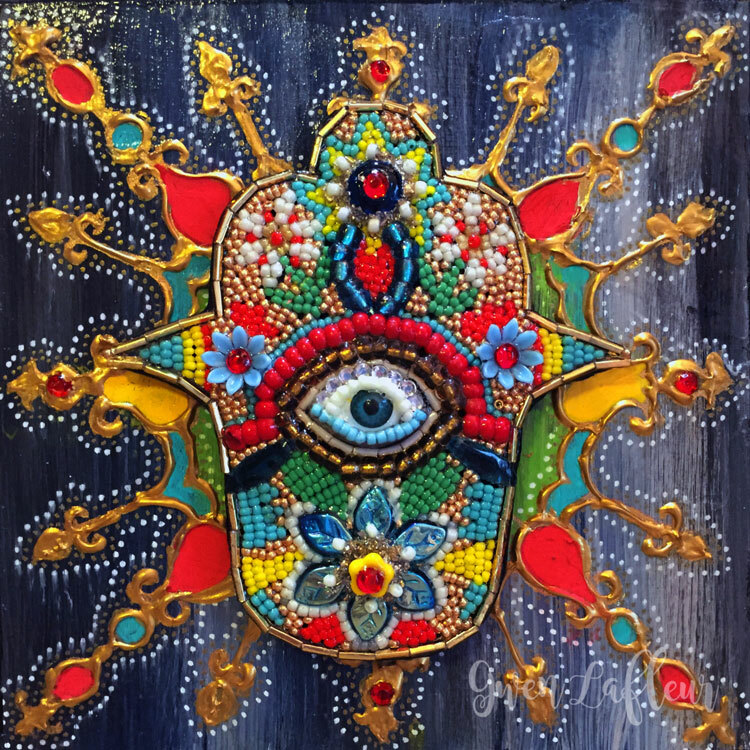 6" x 6" x 1" on cradled birch panel, $145. 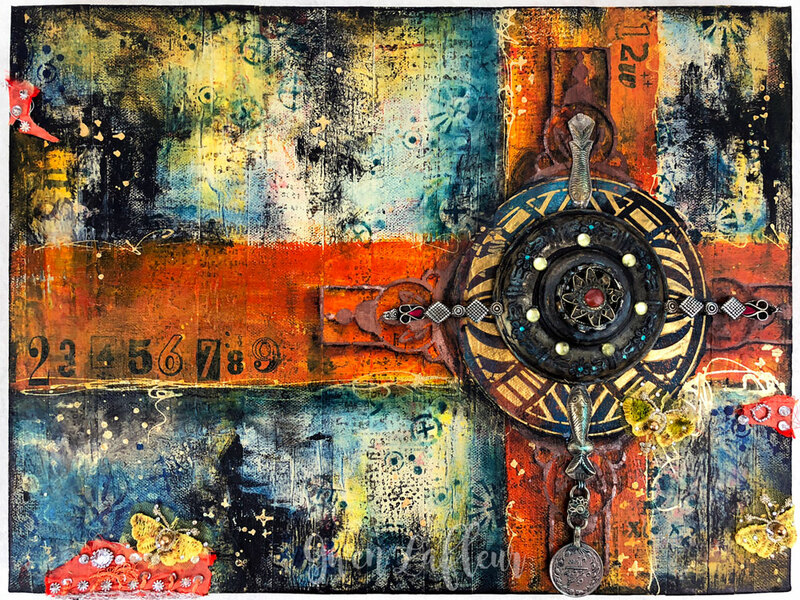 "Make it Count" mixed media artwork by Gwen Lafleur. 11" x 14" x 1" on cradled birch panel. $165 - email if interested. "3-2-1 Contact" abstract mixed media artwork by Gwen Lafleur. 9" x 12" x 1-1/2" on cradled birch panel. "Five" mixed media collage by Gwen Lafleur. 9" x 12" on paper. 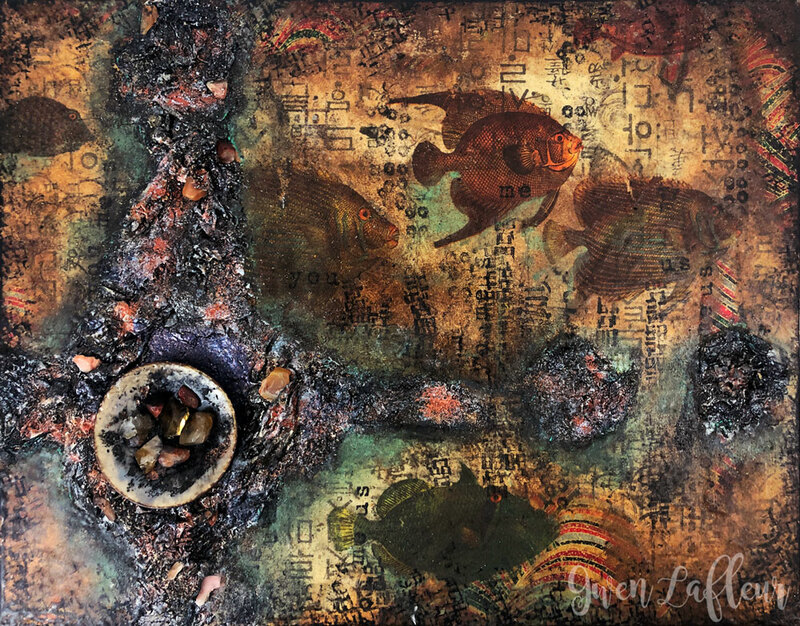 "Murky Depths" mixed media artwork by Gwen Lafleur. 9" x 12" on paper. 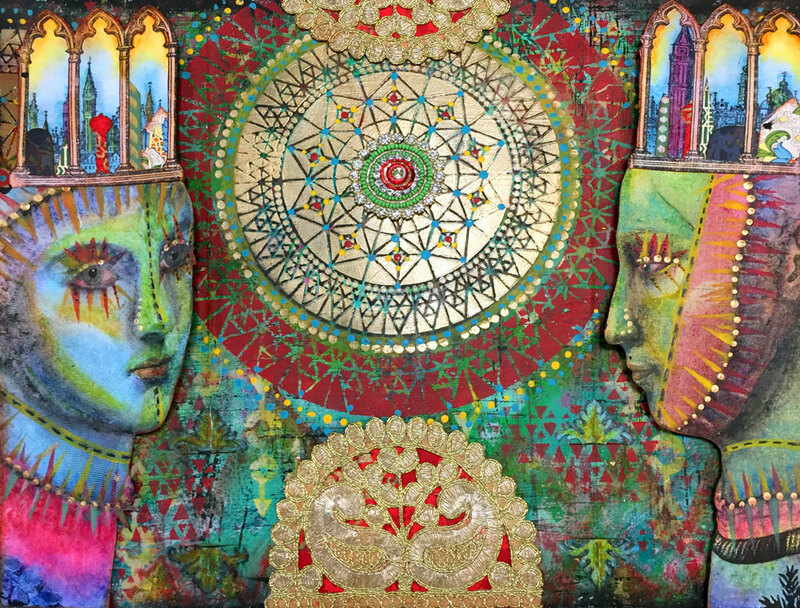 "Psychadelic School" mixed media artwork by Gwen Lafleur. 18" x 18" x 3/4" on stretched canvas. 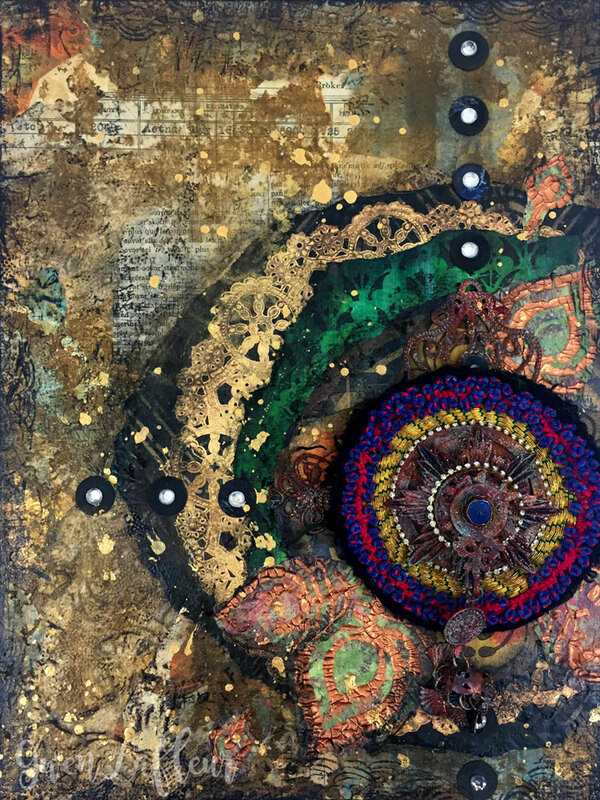 "Wanderlust" abstract mixed media artwork by Gwen Lafleur. 16" x 20" x 3/4" on stretched canvas. $185 - email if interested.